← We have charitable status! 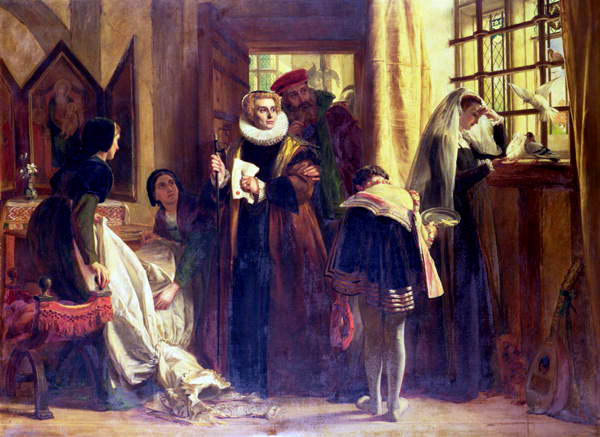 David Templeman has supplied an image of the painting of Mary, Queen of Scots in Sheffield Castle by John Calcott Horsley in 1871. It is the only one depicting her in Sheffield Castle. Note how they are all clustered together and the bars on the windows. They had been reduced to 16 in total with only a couple of rooms to be occupied. A lot of people don’t know that Mary suffered from hyperthyroidism, which caused the fever she often was troubled with, it makes you sweat a lot! And why she liked to bath in wine. Talbot reported that two tonnes had not been enough for her. It would also give you loads of energy than leave you shattered. She fell from her horse one day, when it was stood still! One of the worse effects was to cause her miscarriages. It would have also aged her a lot, hence the white hairs that where found under her own wig at her death. Some historians think she had Porphyria, but this is nonsense and has even been ruled out on the mad King George.